I love both characters, and have read every word of both authors related to them. This post is, therefore, not an attempt to play favourites, but rather a “What if…?” exploration. What if both characters were real and, through magic or time travel, encountered each other? I am only considering what Edgar Rice Burroughs and Robert E. Howard wrote about their respective characters. Now, we also all know that, in an actual story, they would fight, and the fight would probably be inconclusive, before joining forces to defeat the story’s actual antagonist. This is especially true because both respect their opponents, and Tarzan at least prefers to observe an opponent before acting. Conan: Str 18, Agl 16, Sta 18, Int 17, Prs 17, Luck 10. Conan is as strong as a human can be, but not necessarily faster than everyone he encounters. In DCC, warriors add their level to initiative, so part of Conan's speed is represented that way. This helps explain the difference in reaction time in stories like The Tower of the Elephant vs. stories later in his career…he levelled up. His intelligence is extremely high, and he has a great force of personality, but he doesn't generally rely on luck. I would argue that his starting Luck was 18, but that he burned some of that Luck in The Frost Giant’s Daughter to increase the results of critical hits against his enormous foes. Conan has a birth auger of “Born on the Battlefield”, but due to training and background is a polyglot, speaking most of the languages of the Hyborian Era that he encounters. Class-wise, Conan is a Warrior, but he can climb using a d20 (all Cimmerians are trained in climbing), and has a +2 bonus to such checks (on top of his +3 for Strength). Again, if Conan had an 18 Luck at 0-level, his birth auger grants him a +3 bonus to damage. At the mid-range of his career, I would put Conan at 6th level in DCC terms (roughly 12th level in 1e AD&D or 3e terms). Alignment-wise, Conan is Neutral, walking the line between civilization and savagery, neither shunning all magic nor embracing it. So long as a magician is no threat to him personally, Conan can work with the fellow. None of the REH Conan stories are so gonzo as to suggest a level higher than 7th or 8th in DCC terms. A note on Conan’s Strength: Conan is said to have broken the neck of a wild Cimmerian bull at the age of 15, but it is important to remember that Howard doesn’t tell us what a wild Cimmerian bull is like. If Cimmeria is a hilly forested country, this is not a creature of the plains, and is probably not as large as an aurochs, or even a modern bull. Since Conan is otherwise shown as at the peak of human strength, rather than being superhuman, an 18 seems more likely than a higher score. Tarzan: Str 20, Agl 18, Sta 18, Int 15, Prs 14, Luck 18. Tarzan is stronger than a human being, and as agile as humanly possible. He is smart, but not always as smart as everyone around him. He can be imposing, but he can also blend into a crowd, and an actor can take his role successfully, fooling even Jane, so Tarzan’s Personality is definitely lower than Conan's sheer animal magnetism. Tarzan is, on the other hand, extraordinarily lucky. In DCC, when reduced to 0 hp, you get a chance to "recover the body" by rolling under Luck; this is the best mechanic to describe Tarzan's repeated survival from things like getting shot in the head. In terms of Tarzan’s strength, he has thrown a spear that passed through a charging Rhino, and can successfully (and easily) wrestle apes into submission or death even as a youth. By the time we are witnessing Tarzan at his prime, he can handle dinosaurs, giant cave bears, any form of ape he encounters, lions, leopards, etc. Where the animals of the forest feared Tarzan before for his cunning, they now also fear him for his strength. It is notable that Tarzan can brachiate (see below) while carrying an adult male human being with no noticeable loss of speed or effort. Birth auger for Tarzan is “Wild Child”, granting him a +15’ bonus to movement. He is also a polyglot, able to learn any language he encounters, and is even able to speak to beasts in a limited fashion. As a special ability, Tarzan can brachiate, travelling through forest as though on a road in terms of speed. He can climb at the same rate as he walks. When taking his time, he rolls 1d24 for Climb checks. Due to his incredible sense of smell, he can track at speed using 1d24 for checks, even when he is brachiating and tracking something that passed on the ground. Several things that Tarzan does could be represented by either a high Deed Die (indicating a very high Warrior level), or a higher than normal chance to gain a critical hit. I am going to assume the second, and give Tarzan the Thief class. This follows from his known abilities for stealth, disguise, climbing, and attacking from ambush. Moreover, the Thief class has an unusual relationship to Luck that models Tarzan well. If you want to understand just how lucky Tarzan is, consider this: He finds his father’s dagger just in time to kill a gorilla with it (and he is not yet 15!). Over the years, and in many stories, things happen where that knife should have been lost many, many times. Somehow, Tarzan always manages to recover it. Although non-magical, it is never broken, and never so worn or damaged that Tarzan must replace it. Like Conan, Tarzan is 6th level at his career average. Tarzan, unlike Conan, is immortal, having gained perpetual youth through both science and magic. At some point beyond the time of the Edgar Rice Burroughs novels, Tarzan could obtain a far higher level, simply because he will not grow old. Within the ERB stories, Tarzan tops out at 7th level. Alignment-wise, Tarzan is Lawful in DCC terms. He has a group of warriors he is chief of throughout most of his career. He clearly sides with civilized people over natives, imposing British rule in the parts of Africa nearest his home. He longs to be free in the jungle, but volunteers for military service, and often travels to the Americas or Europe, living for extended periods in Great Britain. He is loyal to a fault, and correct enough in his behaviour to allow a friend to kill him in a duel over a misunderstanding (the man, obviously, does not kill Tarzan). …I would have to say that it would depend upon the circumstances of the battle. Tarzan likes to fight from ambush, and seldom misses with a ranged attack. He can throw a spear through a charging rhino, which means that he is stronger than Conan. When REH was writing Conan, he put Conan at the top of human potential, while ERB made Tarzan superhuman. A fight with no weapons in close proximity would be close, but I would give it to Tarzan. Conan is as fast as Tarzan, and undoubtedly smarter than Tarzan (at least in street smarts), but Tarzan's strength gives him the edge. Hell, when you read the stories, Conan isn't always unscathed at the end of his battles, but Tarzan at most gets reduced to savagery by a bullet creasing his skull. Give them weapons in close proximity and Conan's skill more than makes up for Tarzan's strength. Under those circumstances, Conan wins every time. In fact, Conan beats Solomon Kane or John Carter with weapons. John Carter may be the best swordsmen on two worlds in the period of the ERB Mars stories, and he may be far more studied that Conan, but Conan would rip him apart. Indeed, John Carter meets close to his match more than once on Mars, where he has exceptional strength, agility, and stamina due to being from Earth. Finally, Tarzan is repeatedly shown to be very naive, while Conan is repeatedly shown to be extremely shrewd. Given reasonable notice, Conan could gull Tarzan easily enough. Both of them are likely to respect the other, though, and I have a hard time seeing a contest ending in either dead, unless one came upon the other suddenly and just reacted. In this circumstance, despite his fantastic senses, Tarzan would be easier to surprise than Conan...Tarzan is surprised more than once because someone happens to be downwind. Conan the Cimmerian (6th level Warrior): Init +8; Atk by weapon +1d8+3 melee (by weapon +1d8+6) or by weapon +1d8+2 ranged (by weapon +1d8+3); AC 17 (chain + Agility); HD 6d12+18; hp 60; MV 25’; Act 1d20+1d16; SP Deed Die (d8), +3 to hit with longsword, 18-20 crit range, crit 1d30/V; SV Fort +7, Ref +6, Will +9; AL N. Str 18, Agl 16, Sta 18, Int 17, Prs 17, Luck 10. Chainmail, longsword (1d8 damage). Tarzan the Ape-Man (6th level Thief): Init +3; Atk by weapon +8 melee (by weapon +4) or by weapon +7 ranged (by weapon); AC 13; HD 6d6+15; hp 40; MV 45’; Act 1d20+1d14; SP thief skills, brachiate, track by scent, Luck die (d8), crit 1d24/II; SV Fort +5, Ref +7, Will +3; AL L. Str 20, Agl 18, Sta 18, Int 15, Prs 14, Luck 18. Loincloth, dagger (1d4), spear (1d8), short bow and 12 arrows (1d6), rope. Relevant Thief skills: Backstab +9, Sneak Silently +12, Hide in Shadows +14, Climb Sheer Surfaces +14 (d24), Disguise Self +6. Using these stats, you can easily set up a battle between these two legendary Appendix N icons. It should go without saying that, if you disagree with these statistics, you can also change them to better match how you see the characters. Certainly, these stats do not necessarily take into account how Tarzan avoids getting hit by clinging to foes, or his trick of picking foes up and throwing them. This might be described by (1) allowing Tarzan a Deed Die, (2) allowing Tarzan to spend Luck to attempt these deeds, or (3) allowing Tarzan to make backstab attempts at the start of even a close melee due to his speed and skill. In DCC, you can “Quest For” special modifiers like this, so none of these are entirely out of the question. If you do adjust Tarzan in this manner, it may affect the scenarios below, but I would argue that none of these abilities should affect an intelligent Warrior of Tarzan’s level, and thus they wouldn’t affect Conan. If you use a multi-classing system, like this one, giving Conan one level of Thief and Tarzan one level of Warrior. That would grant Tarzan Mighty Deeds, a little more damage, and an average of 18 more hit points. Conan would gain the ability to hide against a set DC in order to avoid Tarzan’s ambushes, and give him an average of 11 more hit points. Scenario One: Tarzan attacks from the trees, ambushing Conan. In this scenario, Tarzan gains his backstab bonus, firing an arrow with a +18 bonus to hit, automatically doing a critical if he hits. He hits on anything but a natural “1”. It is impossible for him to fail to achieve surprise, and if Conan somehow survives the attack (which his high Fort save bonus makes possible, even with the best crit at Tarzan’s disposal), he is able to use his second Action Die to hide again. This is actually a trick Tarzan performs more than once during his career. Conan discovers that facing a horde of Picts is easier than facing a single Ape-Man. 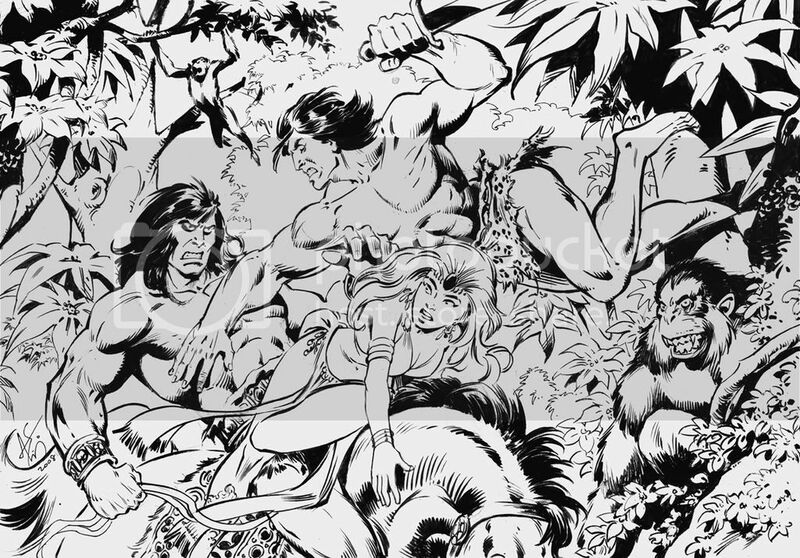 Scenario Two: An unarmed Tarzan and Conan meet each other, both in loincloths. Tarzan expects his speed to help him against this adversary, but Conan gets a large initiative bonus as a Warrior, and strikes before the Ape-Man suspects it. The odds are very good that Conan hits, and is able to perform a Mighty Deed (say, tripping or throwing Tarzan). His Deed Die also adds to his damage. This occurs twice before Tarzan can act, for a range of 16-20 damage. Tarzan, though, has a good Reflex save, and can burn Luck if he needs to, so he keeps his feet. Tarzan is then very likely to hit Conan, with a +8 bonus against AC 13 (Conan with no armour). He burns Luck if need be. He does 1d3+4 damage (5-7), barely a blip on Conan’s radar. Realizing that he cannot survive another round fighting the Cimmerian in this way, Tarzan burns 10 points of Luck to do an additional 10d8 damage. It’s a good effort, but it’s not good enough. Conan drops him in the next round. Because unarmed combat results in subdual damage, and because Conan respects an adversary capable of fighting as well as Tarzan, he leaves him alive. Tarzan now knows to respect Conan as well, both for his prowess and for his mercy. Scenario Three: Conan and Tarzan meet at melee range, each armed with their normal gear. 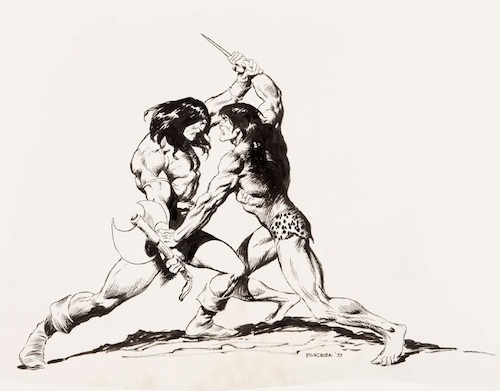 Again, Conan surprises Tarzan with his pantherish speed, striking twice with his longsword for 2d8+6 with each blow (average 15 per attack, or 30 points total), with a 15% chance of a fearsome crit on the first blow, and also allowing Conan to disarm the Ape-Man with his Mighty Deed (no save, so Tarzan’s Luck doesn’t come into play). Conan will skewer Tarzan if he attempts to recover his spear, or to run away, so Tarzan draws and slashes with his dagger. He has a little better than a 50/50 chance of hitting, and will burn Luck if he needs to, leaving far less to add to his damage. Never having met such an opponent, Tarzan instead attempts to save his Luck and run. After all, he can always attempt Scenario One later. Conan gets a free attack, reducing the Ape-Man to 0 hp. Later, one of the Waziri discovers Tarzan’s body. Rolling it over, he discovers that the Big Bwana still lives…but Tarzan is never as cocky going into a physical confrontation again. The damage permanently reduces his Stamina by 1. Had he burned the Luck and stayed to fight, Tarzan would probably have been slain, not having enough Luck remaining to survive the check to recover the body. Scenario Four: Conan and Tarzan meet, armed, but at range. Conan surprises Tarzan with his speed, but cannot close before Tarzan has the chance to launch his spear. Having no idea how potent Conan is, Tarzan spends 2 Luck to increase his damage to 3d8, dealing 13 points to Conan. Seeing that this is only a scratch to the Cimmerian, Tarzan spends his second Action Die to literally disappear into the foliage. At this point, we have a partial repeat of Scenario One. Tarzan begins shooting lethal arrows at Conan, and then changing where he is. But this time, because Conan goes first and Tarzan is not in the trees, Conan has a chance to locate Tarzan despite his stealth. By this point, Conan has taken 28 points of damage, and has had to save vs. instant death more than once. Spending two of his Action Dice to close with the Ape-Man, Conan manages to hit for 2d8+6, a serious blow for Tarzan. Close up, Tarzan can do 1d4+4 damage without burning Luck. He has burned 6 points of Luck, and is willing to reduce himself to 5 Luck, therefore having 7 more points he can use. Two points give him a +2d8 bonus to Initiative, leaving 5 points for a +5d8 bonus to damage. Depending upon the initiative rolls, Tarzan might not need to spend both, or any, points of Luck on Initiative, leaving a possible +7d8 damage bonus. At this point, it all comes down to the die rolls. Here is the thing, though….Where Conan wins, skill decides the day. Where Tarzan wins, Dame Fortune decides, both in terms of the initial scenario and in terms of the massive “lucky breaks” Tarzan would need to defeat the Cimmerian when Conan has a chance to fight back. And this is well in keeping with how their respective creators described the adventures of the characters. In fact, Howard’s heroes tend to use their intelligence to mitigate against bad fortune, while Burroughs’ heroes tend to rely on luck to avoid the worst ramifications of bad decisions. There are a few exceptions in both cases, of course. Howard could write the naïve character who relies upon blind luck and a strong right fist to carry him through, and Burroughs could write the character who uses his brains to solve a mystery. Overall, though, Conan relies on smarts and skills, and Tarzan relies on strength, sense of smell, and luck. I would love to read that story. And this post doesn't even examine those characters designed to be tougher than either. Fafhrd and the Grey Mouser? They don't stand a chance against Conan and Tarzan. I don’t imagine that this post is going to end the “Conan vs. Tarzan” debate. Or even slow it down. Your post has compelled me to read Tarzan. For though I have read every word of Howard's Conan, I have not read a single word of Tarzan (shameful I know!). 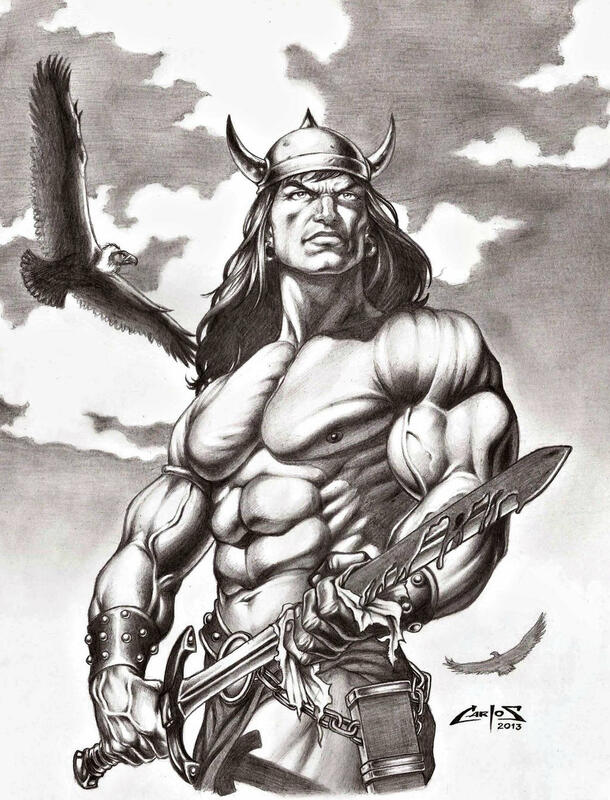 But do not make the same mistake many an unfortunate opponent has underestimating Conan's speed & agility should you meet him on the battlefield. Remember Howard described Conan as a "tigerish barbarian whose motions were blurs of quickness possible only to steel thews knit to a perfect fighting brain...Not with jerky quickness of over-tense nerves, but with cat-like speed that blurred the sight which tried to follow him." As for other great match ups, how about Wagner's Kane or the Death Dealer Gath of Baal or Imaro. In devising stats, I made use of the fact that DCC has more than one way of describing speed. So, the Ape-Man's agility, compared most often to lightning and allowing him to leap onto the back of a charging lion, is higher. But Conan's warrior training - that "perfect fighting brain" still gives him a +6 bonus to initiative, making it likely that Conan will strike first. Against a normal soldier, Conan almost certainly goes first, and strikes twice against Tarzan's single blow. Makes total sense. I really need to read some Tarzan. I unfortunately have done to Tarzan what I warn people not to do with Conan. Making judgements on a character without actually reading any of the original works. So much to read...so little time. I fear that you will find Howard a better writer than Burroughs, although I still think both are worth reading. In any event, the movie Tarzan is not the book Tarzan, although within the continuity of the books, the books are actually published, and the movies begin to come out! (Using these stats, you can easily set up a battle between these two legendary Appendix N icons. It should go without saying that, if you disagree with these statistics, you can also change them to better match how you see the characters.) I like that, but this is if the fight would be in this kind of game. If the fight was in a comic, some factors are missing, like what hero belongs to what comic house. example: marvel allowed captain america to lose to batman and hulk to superman in exchange for victories for spiderman and storm, but when both characters belong to the same house, then batman defeating superman is the result (like the movie)! there are other ways to go about tho, we could use the WWE system to get our results: there the most popular wrestler is the champ period! this is possibly the best because we must remember neither Tarzan or conan are real, the situations are incredible and the places fantastic! Therefore i say, let art in book cover paintings, posters, magazine pics, comics, movies and especially the pen of storytellers like ERB and REH let you decide who wins! The word of the original authors - Edgar Rice Burroughs and Robert E. Howard - are the only things under consideration here. Who wins, then, depends very much on how the fight is set up. You can consider it an exercise in statting people from Appendix N literature, if you like. You can consider it an exercise in demonstrating the versatility of the Dungeon Crawl Classics rules. Or you can consider it a fan letter to the creations of both authors. Nice, and yet it all comes down to how you assign strengths to your characters.... if you choose to see catlike movements over that of speed like lightning? or a life of pampered boredom of being a tyrant yuler of disgruntled citizens of a town whos king you murdered over life among violent, savage fanged and hulking apes in the tropical rainforest of Congo with the closest thing to civilization are tribes of murdering cannibals. ERBs first story is more than 4 times as long as Howards story and thatmuch better. I suppose I will give Tarzan 4 times more stamina than Conan. Yes, I do agree that Tarzan is ever more cautious but that is to his advantage and that Conan striking first could be ruthless and sneaky but also to his advantage and one he desperately needs against Tarzan. Conan faces 5 conspirators and an ape-like demon in his first story and wins because of a magically marked sword. Tarzan faces all kinds of real savage predators and dangerous beasts, cannibal warriors and their witch doctor, is shot with a rifle on the head and wounded by his French friend by accident but quickly heals and learns about himself technology and civilizaed humanity. when assigning powers you cannot be partial. You need to understand the rules system being used as well as the characters. My interpretation is based on having read all of REH and ERB's stories about these characters, not just the first. It is also not a matter of seeing "catlike movements over that of speed like lightning", but looking at what actually happens in the stories rather than using the similes and metaphors their respective authors preferred. I actually gave Tarzan maximum human Agility (18) and more than maximum human Strength (20). Conan is less agile than Tarzan. Conan has a consistent speed of action which is based in part on Agility, but in part on his warrior's training, resulting in a higher initiative bonus than Tarzan. Tarzan, on the other hand, has an ability to spend Luck to receive a substantially higher bonus than Conan gets. Sure, Tarzan does sometimes suffer horrific wounds, and there are no firearms in Hyboria, but Conan does survive being crucified, and comes back from that without any longterm damage. I give both maximum human Stamina, because both exhibit it in their stories. Both are polyglots who easily pick up additional languages, but there are several stories in which Tarzan falls for tricks that the reader certainly knows are tricks, so I give Conan a slight advantage in Intelligence. There is also a story in which Conan clearly succeeds in a spell check. Personality-wise, both can be imposing and strong-willed, but Conan always stands out, whereas sometimes Tarzan blends in. More, Tarzan has lapses in his memory, often shedding his outer personality completely to rejoin natives and/or apes. Conan's Will save appears to be better than Tarzan's, based on the events of several adventures of each character. Tarzan is clearly luckier than Conan. He is lucky enough that ERB actually mentions his strange relationship to fate, and this jibes well with both the Thief class and the "recover the body" mechanic of DCC. Although Conan has actually worked as a thief, and has some of the skills thereof, Tarzan exhibits the stealth, disguise, and backstab functions of a DCC Thief regularly in his adventures. As I said earlier, though, I don’t imagine that this post is going to end the “Conan vs. Tarzan” debate. Or even slow it down. I have a deep, abiding love for both characters.....and for Dungeon Crawl Classics, a game system robust enough to actually be able to stat them out reasonably close to how they appear in the literature!